I can’t think of a project I’ve worked on with more layers of complexity. When I was contracted to help out, this Anthem Blue Cross Blue Shield project was already behind by about two months. Only a few members of the team had been trained in Agile and to make matters worse, the UX was being conducted offshore. This project was very heavy on industry-specific material and unless you were exposed to this type of health information on a daily basis, you might have felt like you were working on a martian portal… for martians. Because of the complications the team had been suffering through prior to my arrival, the Agile cycle had been put on pause and I was given two weeks to make sense of the situation. I had been trying to formulate a plan to move back to Georgia when this contract came around. We decided that I should mentor/coach another Jr. UX designer in the event a hand-off was required down the road. I knew the first two weeks were going to zip by very quickly and there wouldn’t be a moment to waste. I made it very clear from the outset that access to the Product Owner, Business Analyst and Lead Engineer would be critical to meeting my responsibilities. Despite palpable tension, everyone was very approachable and helpful. This was a first-generation product so there was no AS-IS experience to review. We were dealing with a blank slate, a never-before-done Agile team, cultural and time zone disparities (offshore UX) and a project effort grossly behind schedule. The Notification Center will allow Anthem Blue Cross Blue Shield Providers the ability to create various notification types triggered by key patient care events. What will the notification center do? 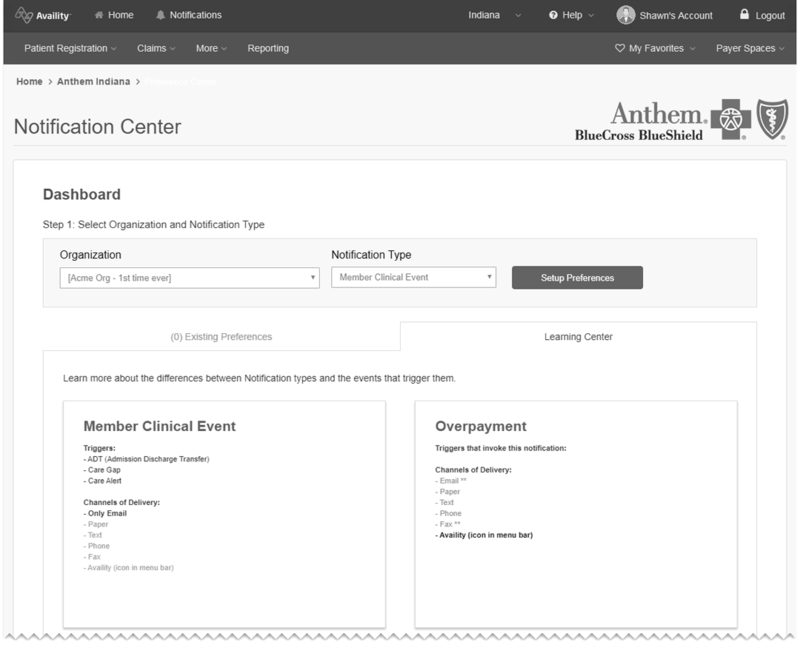 The Notification Center will allow approved provider operators the ability to setup, edit and delete notifications through the Anthem/Availity Payer Spaces portal. 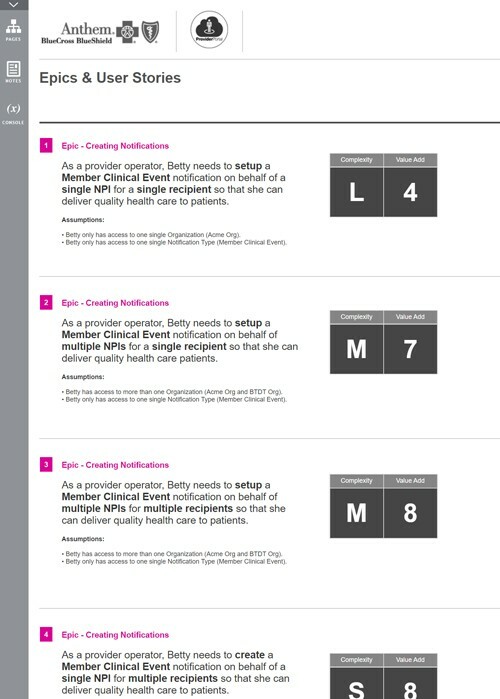 The Notification Center will accommodate a variety of notification types that are triggered on one or more key patient care events. Notifcations will be delivered differently and according to various factors of importance to the event and patient care that event relates to. Delivery channels include, email, Availity alert bar, mobile push, fax, phone and snail mail. Why is this good for Anthem’s Provider Network / Patients? Our provider network is responsible for providing health care to millions of patients across the country. To deliver this quality service and care, providers rely on Anthem to deliver innovative and helpful ways to achieve their goals. We are all living and operating in a more connected and technical world than ever before and demands promote the use and implementation of technology to satisfy the growing needs of the population. Why is this good for Anthem? Our provider network has come to expect best-in-class service and patient information that allows them [the provider] to deliver quality health care to their patients. Continuing to provide value to our provider network strengthens and renews partnership and sustains business operations. Companies that invest in the production of digital experiences want to see a return on their investment; they want their intended audiences (customers) to use the experiences they finance. The risk to user adoption should always be an important consideration any time an investment is made to bring a new digital experience online. This risk is increased based on various factors. Some of those factors often include the number of users impacted, the perceived complexity of the information the experience contains and importance of the experience to the brand. Building the Notification Center for Anthem was going to be a lot different than building a common retail shopping experience or a brochure-style Web site. The data involved was complex and very industry-specific and would target an audience whose proficiency in the health care sector was required. Unfortunately, there was no budget for user testing set aside in the scope of work making this a very high risk project. The decision to forego user testing is always at the client’s discretion. However, as an ambassador for the user, I like to make sure there’s evidence that I’ve covered the topic of usability and have documentation that a risk assessment was explored and the findings presented to decision-makers. Building the Notification Center for Anthem was going to be a lot different than building a common retail shopping experience or a brochure-style Web site. The data involved was complex, very industry-specific and would target users whose aptitude for the healthcare industry was paramount. Unfortunately, there was no budget set aside for user testing making this high risk to user adoption. The decision to forego user testing is always at the client’s discretion. However, as an ambassador for the user, I like to make sure there’s evidence that I’ve covered the topic of usability and have documentation that a user adoption risk assessment was explored and the findings presented to decision-makers. Before I could propose user interface ideas, I would first need a primitive understanding of data relationships, industry terminology and user profiles. I made sure to set some time aside each day during my first week devoted to fast tracking my knowledge in this area by working directly with Subject Matter Experts (SMEs). In these workshops, I attempted to better understand the 1-to-many and many-to-many data point relationships, the various user roles (and subsequent permission levels) and key industry terminology. I produced and circulated several design artifacts during these workshops to ensure my understanding was consistent with the Product Owner. A few of the artifacts included a “world view” map, lexicon of vocabulary and a list of role-based persona (user) classifications. This team had decided to work a bit unconventionally when it came to Agile. The Product Owner had delegated the administration and definition of the Product Backlog to the Business Analyst. As sprints began, the Product Owner would then switch out user stories mid sprint causing all kinds of chaos. I’m not implying this was intentional, just signs of a group new to Agile. So I made it a point to cover the importance of the Product Backlog Grooming including ownership, prioritization and the value of committing to user stories once they were added to a Sprint Plan. I convinced the team to approach Sprint 1 as a 30 day effort. Sprints thereafter would be shortened to two weeks. 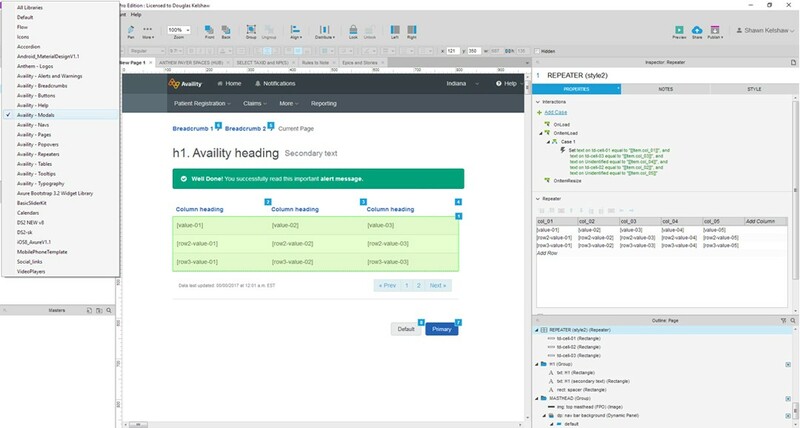 Address user stories that would lay the foundation for the portal’s main navigation, base page canvas and common header/footer elements using the third-party Availity UI toolkit (based on Bootstrap 4.0). Address user stories that would add value to a potentially ship-able Notification Center business product by end of Sprint 1. Let me know if you need anything. I have seen and heard great feedback on your work, and to be honest you’re probably the best new hire I have hired that got acclimated to the crazy and dove right in. You’re a true asset to the team. I’m very impressed, and I report that up. Dan S.
With an Iteration 0 Backlog Grooming session out of the way, we now had the Product Owner’s prioritized list of Epics as well as a variety of supporting user stories. It was time for “happy path” user flow diagrams that supported the priority epic, Creating Notifications. I had grown accustom to using Jesse James Garrett’s Visual Vocabulary to articulate high-level user flow diagrams from my time as UI Producer at USAA. This boxes and arrows diagram tells the story behind an existing (AS-IS) user flow and/or proposed (TO-BE) user flows. 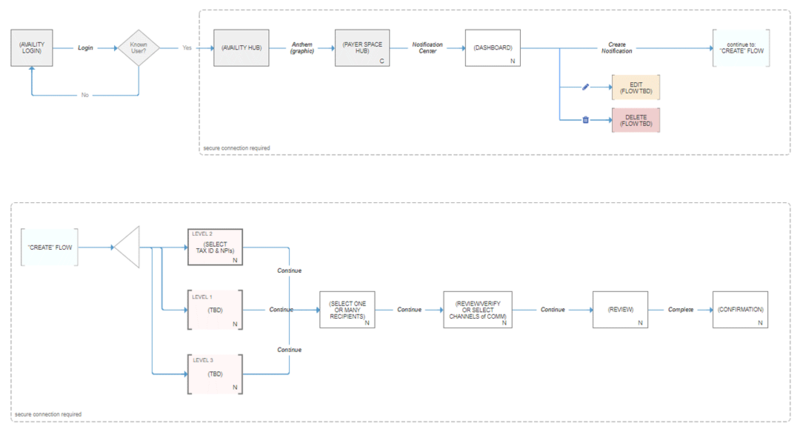 User flow diagrams can be produced relatively quickly and often stimulate great feedback on user, technical or system challenges the experience may face down the road. The various markings and labels found within the diagram offer clues about a proposed experience flow as well. For example, grey boxes with the letter “C” in the lower-right corner are pages that currently exist but will require changes to support the current project effort. Arrows with bold, italicized text are labels found on primary call to action elements. White boxes with the letter “N” in the lower-right corner are brand new pages that need to be created from scratch in order to support the current project’s build. The presentation layer of the Anthem Notification Center was required to leverage a third-party UI kit produced by a group called Availity. The Availity UI kit was based on Bootstrap 4.0 and was HIPAA and WCAG 2.0 AA compliant out of the box. Strangely, there was no requirement for a responsive (mobile and tablet) experience. Despite my every effort to educate and convince leadership that Bootstrap/Availity UI Kit was an out-of-the-box mobile-first platform, I was told to not be concerned with any other display beyond the desktop breakpoint. At the time, I was mentoring a Jr. UX designer (offshore) and thought that assigning her the task of producing the Availity UI kit would be a great assignment. She was a great visual designer, but she was lacking exposure to (and experience with) object oriented programming (OOP) concepts. Designing a custom Axure library (complete with interactivity) would be a great place to study OOP concepts while also working on an important project deliverable. Because of our time zone differences, she and I would meet early in the mornings for reviews of the custom Axure library and during the days, I was preparing low-fidelity wires of the Notification Center’s happy path user flows (supporting the Create epic and using Axure’s native component UI library). Shawn was a great UX design manager and his expertise in Axure helped me to achieve accomplishment of project modules to a great extent. It was quite gratifying to play such a major role in turning this complex project around from near death. It took the whole team. Upon my departure, the scrum board was filled with vetted user stories, the room filled with the comfortable murmur of collaboration and a Jr. UX designer on her way up to managing complex UX problems with confidence. Back on track! The Anthem Notification Center was nearing cancellation prior to my arrival. I was proud of the progress we made together as a team in a very short time frame to turn everything around. It took a lot of work to do and had I had the option to work remotely from Savannah, GA, I would have stayed with this until the end. Despite having to leave the project soon after getting it back on track, I am proud to say I was able to train the team on how to include the user’s perspective within an Agile development program while also training a junior UX’er on how to keep the cycle going. Anthem, Inc. is an American health insurance company founded in the 1940s, prior to 2014 known as WellPoint, Inc. It is the largest for-profit managed health care company in the Blue Cross and Blue Shield Association (Wikipedia). Thanks for your time with Anthem Shawn. Best of luck. I truly do think you’re the best UX designer I have ever seen in action and while difficult to see you go, I’m willing to give you an outstanding recommendation if needed.